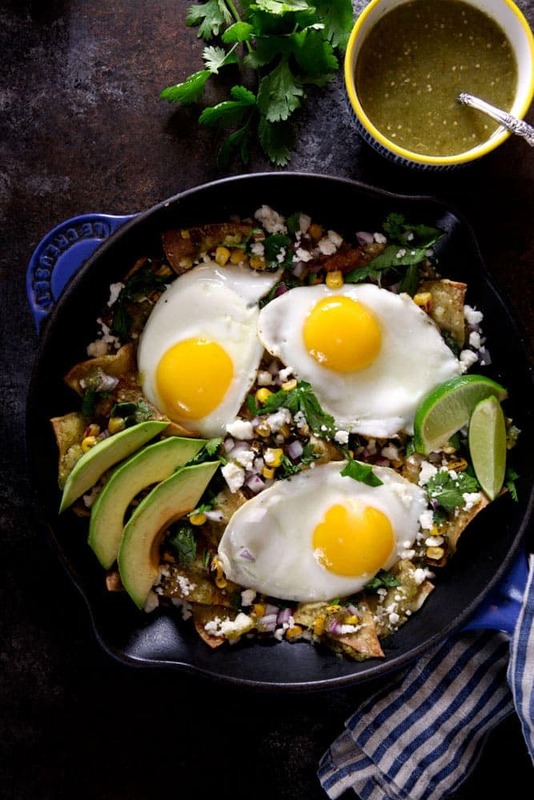 Baked Chilaquiles Verdes with Tomatillo Salsa | Healthy. Delicious. I created this baked chilaquiles verdes recipe for my client, Cacique. Thank you for supporting the brands that keep me inspired in the kitchen. If you haven’t noticed, I really love Mexican food. Like, a lot. I could probably eat it every day and not get tired of it. My obsession started with traditional favorites like tacos and enchiladas, but it didn’t take long for me to fall in love with other dishes like tamales and mole. I didn’t discover chilaquiles until recently, but it was basically love at first bite. Cripsy chips are coated in a thin sauce (I use salsa verde, but you could also use enchilada sauce or even mole), then then garnished with fresh toppings, salty cheese, and runny eggs. They have the spicy/salty/acidic/fresh balance that I’ve come to expect from good Mexican food. Plus, they basically make eating nachos for breakfast socially acceptable! 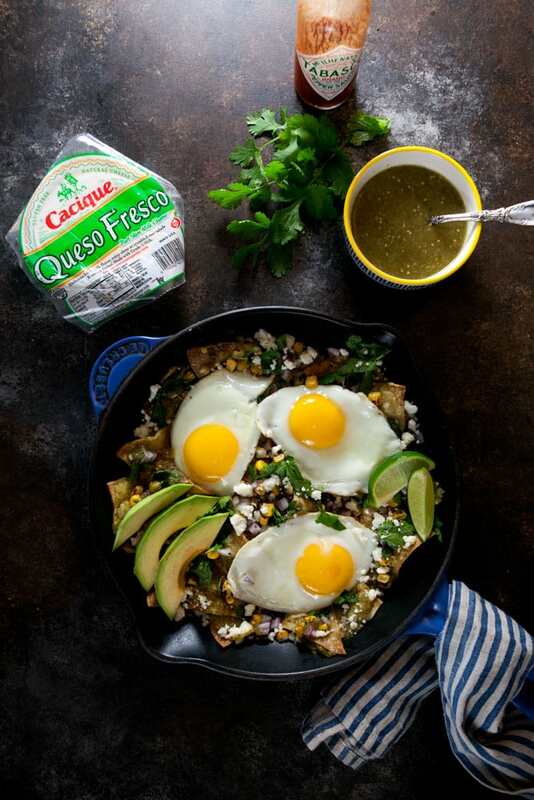 If you’ve been following along on Instagram, you might have seen that I’ve been sharing step by step photos of my baked chilaquiles verdes all week. They’re really simple to make, but they’re chock full of flavor. Make your salsa verde. Sure, you could use a store-brought salsa here. In a pinch, that makes sense. But fresh salsa verde is super easy to make, and the flavor can’t be beat. 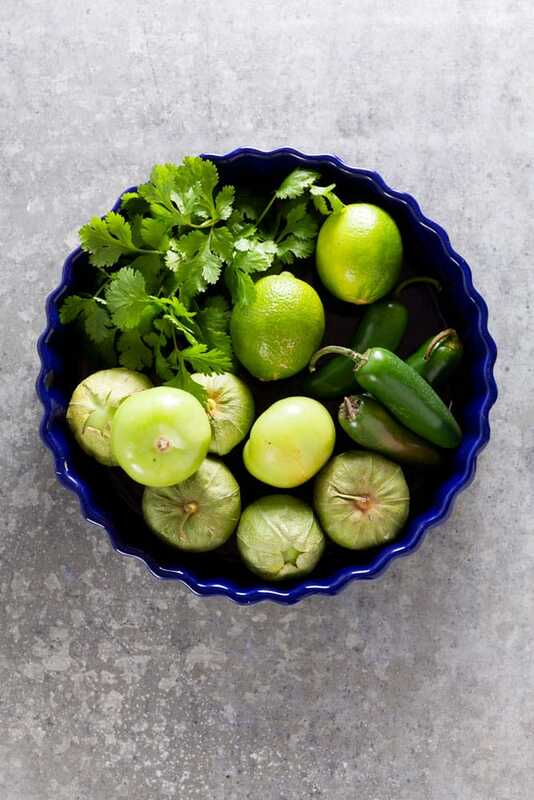 All you need is 15 minutes, a few tomatillos, some onion, a jalapeno or two, and a bunch of cilantro. Bake your tortillas. Fresh tortillas – specifically white corn tortilla – REALLY make a difference here. They’re sturdier than store bought chips and have more flavor and less salt. Most recipes call for frying the tortillas, but I bake them to keep things on the lighter side. Gather your toppings. 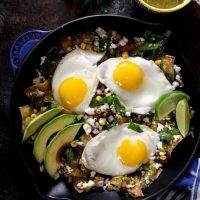 I like to add some freshness to my baked chilaquiles by making a simple salsa with fire roasted corn (I always have a bag or two in my freezer), red onion, and cilantro. I add crumbled queso fresco right into this mix. Queso fresco is a fresh cheese with a texture similar to mozzarella, but with a tangy, salty flavor similar to a mild feta. Cacique’s queso fresco is pretty easy to find here, even in stores that don’t have fancy cheese sections. You can use their store locator to find it near you. Cook a few eggs. Because everything is better with an egg on top. I like mine over medium – soft enough for the yolk to be thick, but still a little runny but cooked enough so the whites are firm. Put it all together. Coat your chips with salsa verde and bake them for a few minutes to let the flavors come together. I like to add some of my toppings before I bake them, too. Then, add the rest of your toppings and the eggs. I also serve mine with hot sauce (because hot sauce + eggs = life) and avocado slices to balance out the heat. To prepare the salsa verde, add all of the ingredients to a small saucepan and bring to a boil. Reduce to a simmer and and cover. Simmer 10-15 minutes, or until the ingredients are all soft. Transfer to a blender; blend until smooth. Season to taste with salt. While the sauce cooks, prepare the chips. Cut each tortilla into 8 wedges and brush lightly with oil. Arrange on a baking sheet in a single layer (I like to line my pan with a silpat). Bake at 350ºF for 10-12 minutes, or until lightly browned and crisp, turning halfway through. In a small bowl, combine the corn, red onion, cilantro, queso fresco, and salt. 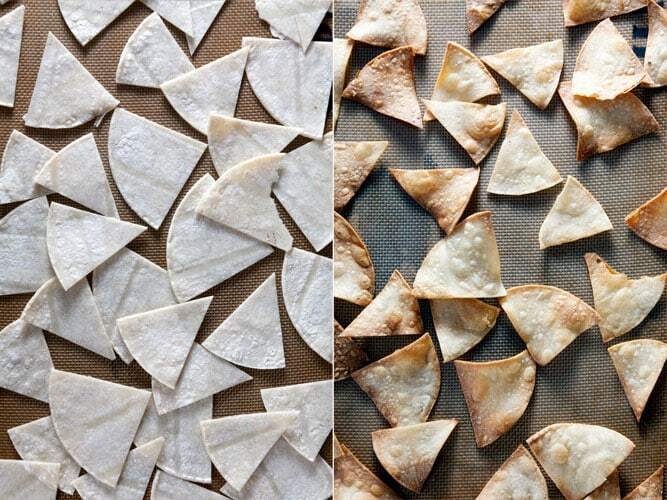 Transfer the baked chips to an oven proof pan. Pour 1/2 cup of salsa verde over the chips, stirring to coat well. Top with half of the corn salsa. Bake 5 minutes, or until warmed through. Top with fried eggs, avocado, and remaining corn salsa. Serve with additional salsa verde, lime wedges, and hot sauce. 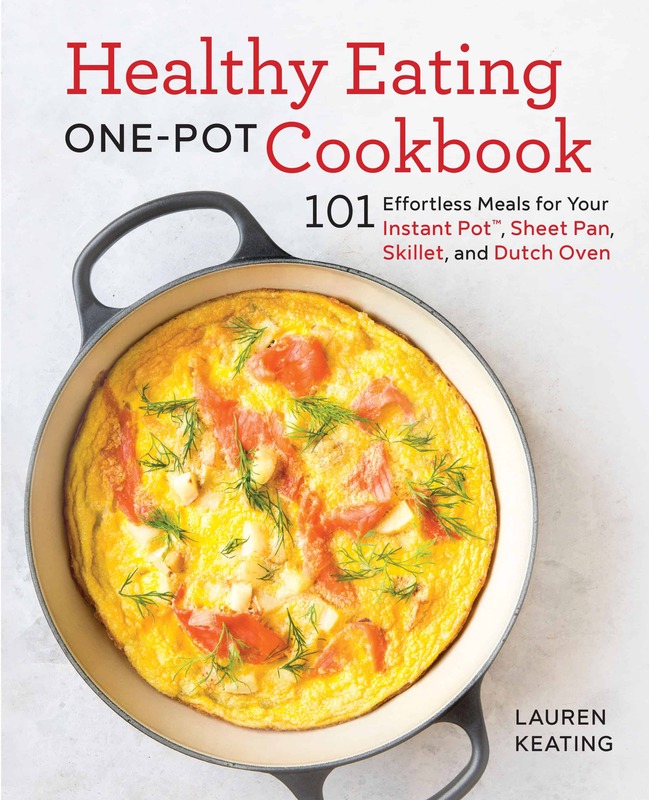 Smothered Chicken and Quinoa Skillet – Healthy. Delicious. 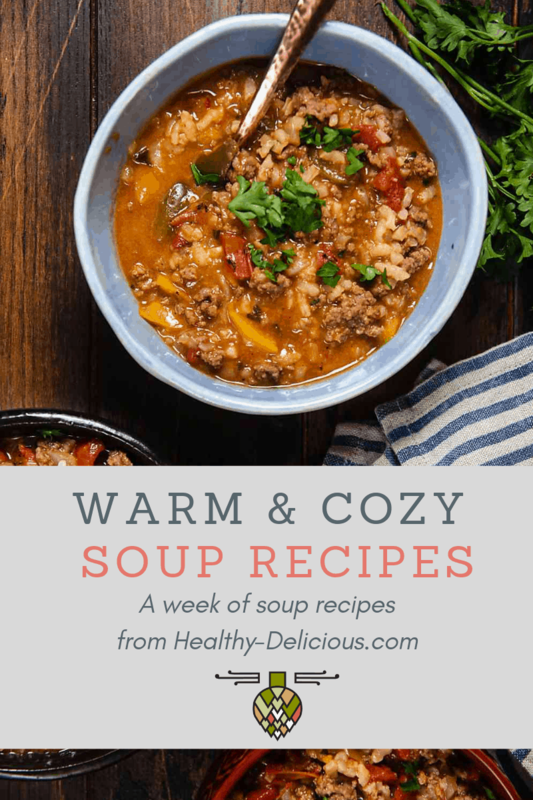 Chicken Tortilla Soup – Healthy. Delicious. It’s so mouthwatering and colorful! Thank you for the post!!! It’s so mouthwatering…It look so colorful and yummy.Thank you for the post!